You first need to import your master images into Lightroom. Typically these will be RAW files, but they may also be high resolution JPEGs or even TIFFs. It's very important that the original filenames, as generated by the camera, are left intact. The plugin will match files using these names. If you prefer to rename your images then you'll need to do this after you've synchronised the Selection List - not during import. 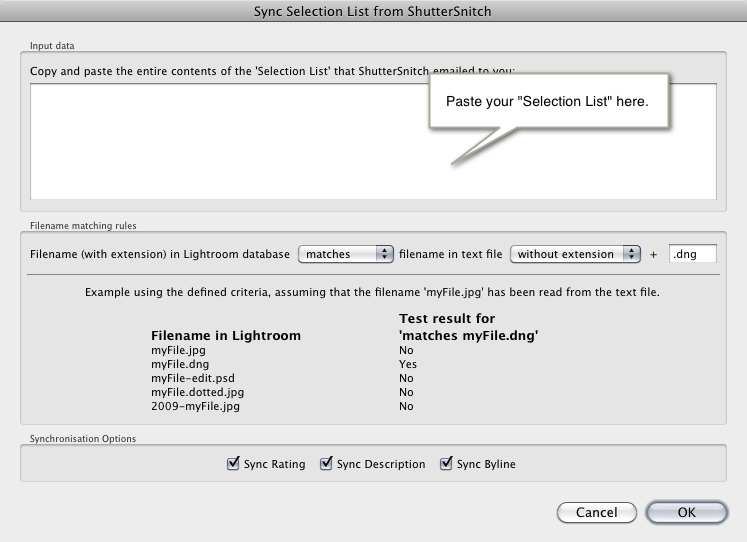 The Selection List can be exported by ShutterSnitch and sent to you by email. This contains a list the of filenames of the images inside the collection along with the ratings, descriptions and bylines for each image. To do this, press ShutterSnitch's "Export" icon, select the images that you wish to synchronise (an outward pinch gesture on the filmstrip will select them all), press "Export", then choose "Selection List". First, copy and paster your Selection List into the field provided. Next, you must specify how the names of the JPEG files listed in the Selection List should be matched to master files inside Lighroom. In the example above we're looking for an exact match for DNG files with the same base name. The matching options are quite flexible, and a filename in the Selection List match can potentially match several results - the example result should help make this clear. This may be useful if you've already created derivative images and wish to match them all. Finally, you can choose whether to import the rating, description and byline ('Creator') information.